Both women and men of varying ages contribute to this ministry of love and encouragement. Cloth remnants are traced, cut, and then sown together in the shape of bears. Then polyester stuffing is used to fill the bears to make them soft and huggable. Love bears are distributed to hospitals, police stations, fire departments, and rescue squads in our community to be used with scared and hurting children. 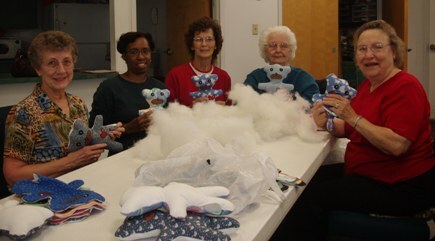 Over one thousand five hundred bears are produced each year by volunteers from the Bayside family. A group of ministry participants meet most Tuesday mornings at 9:30 a.m. in the fellowship room to assemble bears [Refer to the church calendar in the members area for specific scheduling]. All members are encouraged to add their time, talents, and energy to this worthwhile cause. If you would like to participate, but are not able to attend Tuesday mornings, contact group participant Cassy Satberry to discuss ways you can help. On a quiet Sunday afternoon in 1991, a lovely young woman named Martha Love enjoyed a leisurely drive down a Tennessee highway after church. Riding along with her were her young son, Andrew, and her good friend, Fanny. Soon she would give birth to a second baby, and their family would be complete. Martha Love’s life should have stretched out for years of happiness. But life holds no guarantees, and that day Martha lost control of her car. Later, desperate doctors saved her unborn baby, but Martha died two days later. Baby Will Love joined his brother Andrew, never to know his wonderful mother. Later, Martha’s friends from church remembered their feelings of helplessness as they tried to comfort two year-old Andrew, afraid and lonely in the hospital, crying for the mother he would not see again. For months there ladies put their creativity and caring together and decided to launch the “Love Bears” project in Martha Love’s memory and to honor Andrew and Will.